Unlearning Cook, Part Three [4.00pm 19 October - 9.30am 1 November 2016] was recently announced as the winner of the Best Work by a CCP Member at the 2016 Centre for Contemporary Photography's Salon. This work is part of a long-term project and my MFA research. Thank you to the CCP for your support of photographic artists and to Michaels Camera for sponsoring this prize. Thank you to the judges of the Salon this year - Janina Green, Dylan Rainforth and CCP's Michelle Mountain. The exhibition continues until 17 December 2016. Unlearning Cook, Part Three [4.00pm 19 October - 9.30am 1 November 2016], 2016, 12 unique silver gelatine solar photographs, 80cm x 78cm, 1/1. This new photographic work, created this year as part of my MFA research, was selected as the winner of the 2016 Linden Postcard Show. Thank you to Linden New Art for their support of the arts. Thank you to the anonymous donor who generously funds the first prize and to this year's judges Michael Brennan (LUMA), Emma Buskowsky Cox (Castlemaine Art Museum), Adam Harding (Horsham Regional Art Gallery) and Pat Mackle (Avant Card). Congratulations to all the other winners and to all the exhibiting artists. The exhibition is open until 29 January 2017 at Linden New Art. Unlearning Cook, Part One, 2016, Archival inkjet print, 8in x 10in. I was very excited to have some of my work included alongside a group of wonderful Australia-based photographers in the Belonging exhibition at the recent 2016 Obscura Festival of Photography in Penang, Malaysia. The show was curated by Melbourne-based artist, educator, writer and curator Daniel Boetker-Smith. "This exhibition explores the complexity of contemporary Australian identity and belonging. 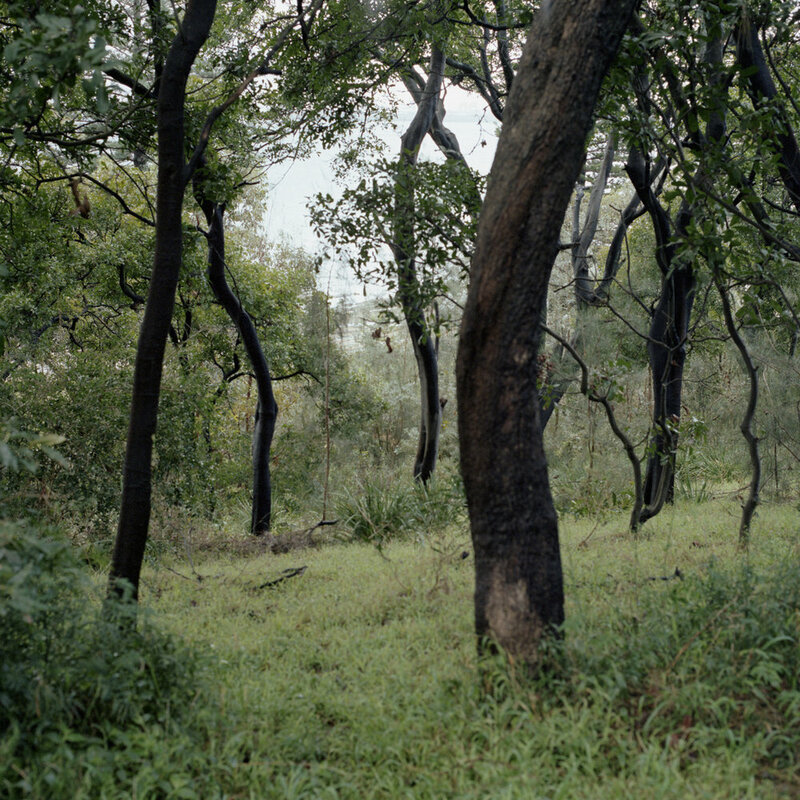 The works bring together a diverse array of photographers who contemplate personal and public notions of belonging in the context of Australia as both the ‘lucky and unlucky country’. Australia is shown as the land of the fair-go, and of constant possibility, but also as a land of rivalries, prejudices and violent pathologies. Collectively this exhibition seeks out threads of a narrative of the mythic Australia. Myths jostle, and contradict one another; they are stories that a nation and its people tell themselves again and again, and they become reworked through the images a country produces. This collection of images, ‘probes the contradictions inherent in myth, seeing place and belonging as both life-giving and annihilating'." Featured artists: Stacy Arezou Mehrfar, David-Ashley Kerr, Simone Rosenbauer, Dale van Iersel, Hoda Afshar, Kate Golding, Katrin Koenning, Kelvin Skewes, Michael Corridore, Phuong Ngo, Raphaela Rosella, Ricky Maynard, Robyn Daly and Sarah Pannell. The two works selected by the curator were made on Gooreng Gooreng Country, Queensland. The landscape image below was made on my first visit to the area in mid-2014. The portrait photograph was created last year when I returned to the Town of Seventeen Seventy to attend the 1770 Festival which occurs in May each year and includes a play where Cook's landing is reenacted. In 2015, Shane Webster played the role of Lieutenant James Cook R.N. Another two works from my research project were selected to be part of a curated group exhibition at Gaffa Gallery in Sydney, New South Wales in April this year. The exhibition was curated by the incredibly talented Melbourne-based artist/writer/curator, Christine McFetridge and featured the work of Victoria-based artists Ariel Cameron, Isabella Capezio, Coby Baker, Dianna Wells, Hoda Afshar, Jessie DiBlasi, Kate Robertson, Katrin Koenning, Linsey Gosper, Rebecca Nadjowski and Zoë Croggon. "Symbols of strength, power and triumph are often feminine. In Greek mythology, the winged goddess, Nike, represented victory in times of peaceful competition and unrest. She is closely aligned with Athena, the goddess of wisdom and war. Among others; African, Baltic, Celtic, Egyptian and Hindu mythologies also contain figures of female victory, and indeed nothing typifies the Antipodean woman more than strength. She exists in a harsh climate; exposed to the weather and the reality of her isolation to the rest of the world. However, traditionally, the Western ideal of success for a woman is measured by her beauty and in her ability to raise children, keep a happy husband, and a tidy home. Women who veered from this trajectory were at risk of being scorned. Increasingly, from the nineteenth century, women began to be celebrated for their successes - though often acquiring the habits of successful men to be assimilated into positions of social power. Arguably, women still struggle for recognition of their achievements if the achievements themselves are outside the superficial. This exhibition, Victory, seeks to highlight women photographers working in Victoria. Moving through landscape and man-made environments, the artists included accomplish great feats; holding their clenched fists high, charging forward. Sometimes cheeky, sometimes a little more serious; the work places women at the central point of focus. These artists are adventurers, conquering their surrounds and championing ideas. Gracefully this woman moves, dances, leaps; like Helen Garner, Ponch Hawkes, and Joan Kirner, these artists take ownership of their craft sounding a barbaric yawp." Given the title of the exhibition, the curator and I decided to include the following two works from my research into the monumentalisation of Captain Cook in the Pacific. Both photographs were made in the Hawaiian Islands in 2012. The first, commemorates Cook’s landing on the island of Kaua‘i in January 1778. Over time, this monument, made from lava rock, has been moved off its axis by large surf and the bronze plaque vandalised and removed so that no trace of Cook remains at the site. 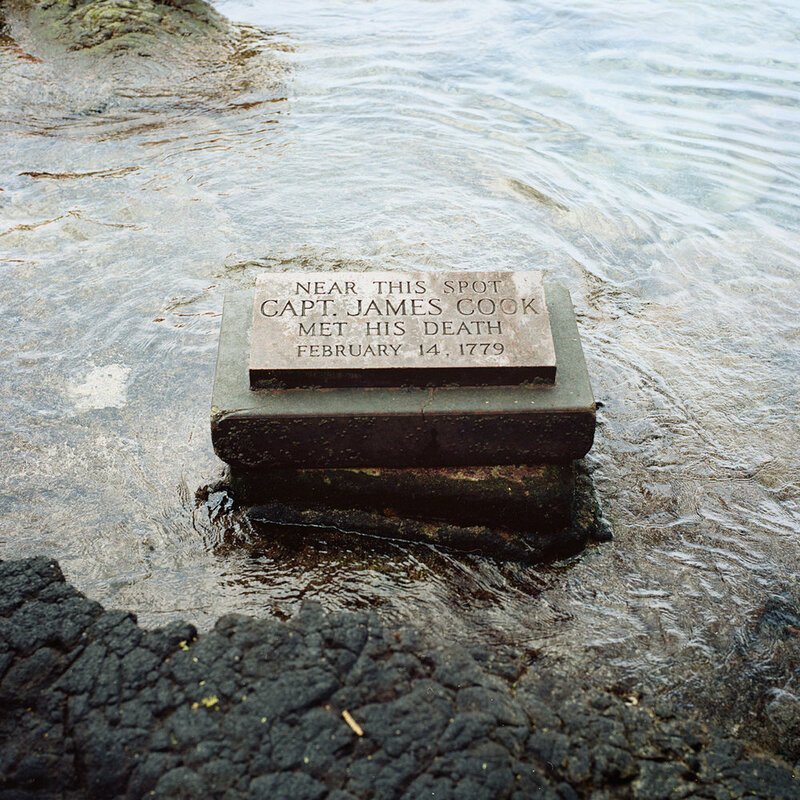 The second, marks the spot where Captain Cook was killed on 14 February 1779. This particular memorial, in the island of Hawai‘i's Kealakekua Bay, is only visible at low tide and when I saw it in 2012 it had been moved off its base by the constant jostling of the ocean’s waves. This action of nature reclaiming and decolonising the landscape is a phenomenon I have observed at many of the monuments I have documented. It seems that the natural elements tend to slowly and victoriously degrade the man-made monuments over time. 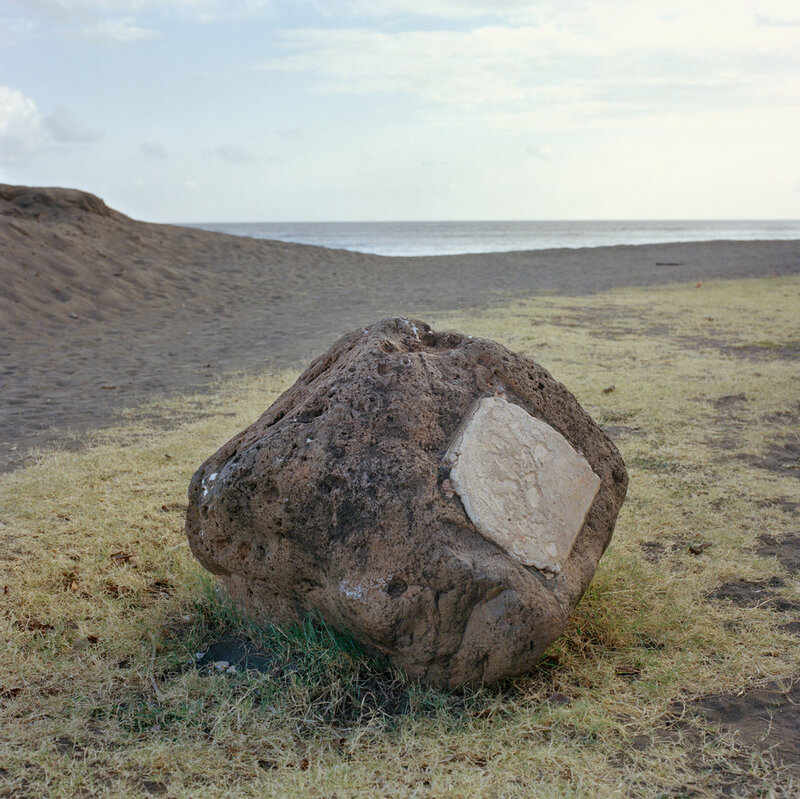 Defaced monument, Captain Cook Landing Site, Lucy Wright Beach Park, Kaua‘i, Hawai‘i 2012, archival inkjet print, 42 x 42cm. 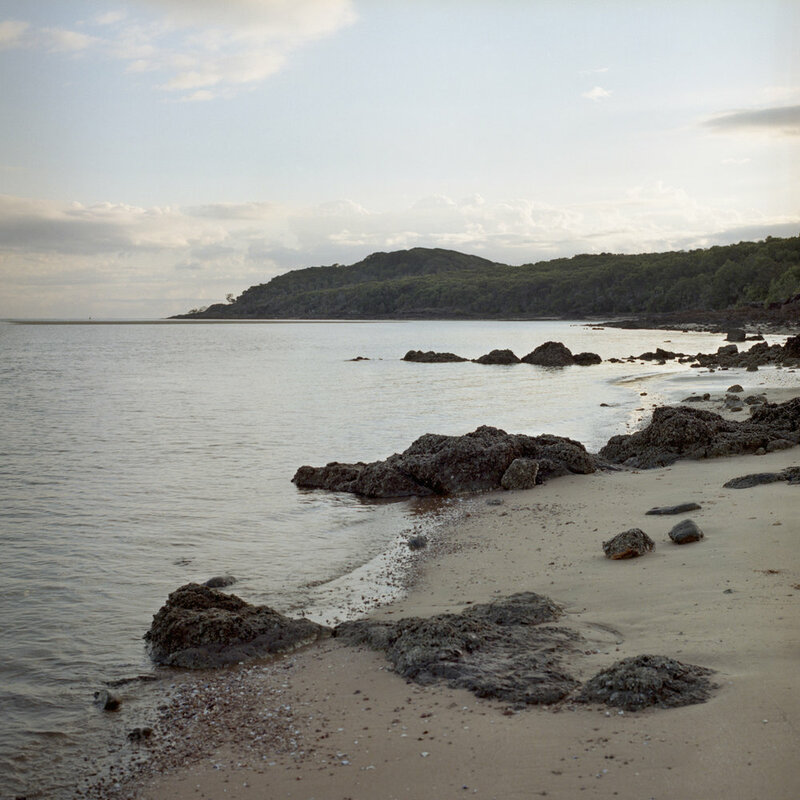 Kealakekua Bay, Hawai‘i 2012, archival inkjet print, 42 x 42cm. 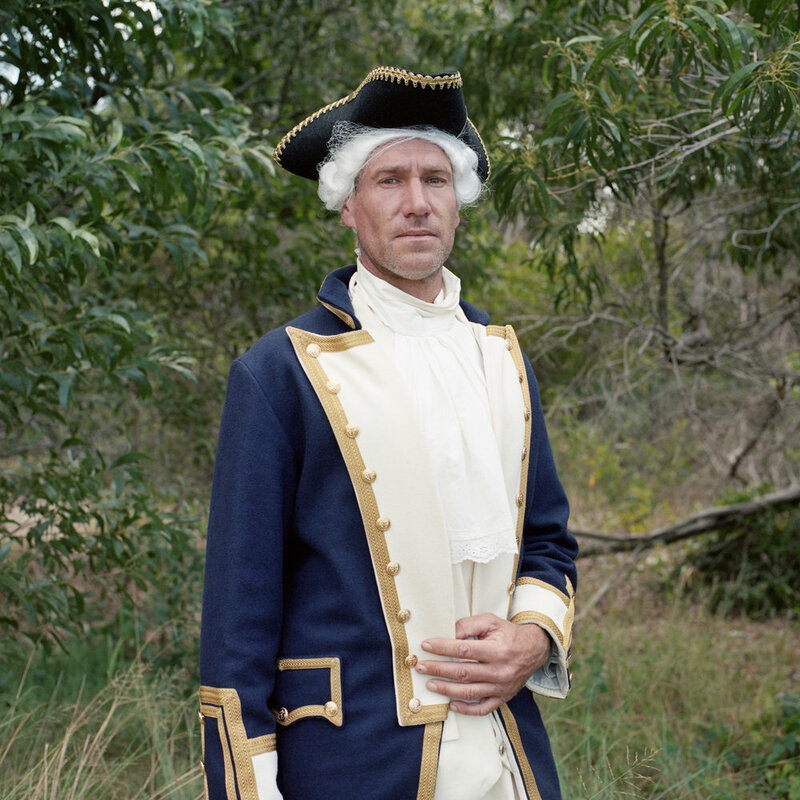 In April, two works from my ongoing research that critiques the voyages of Captain Cook were featured in an exhibition at the Land Dialogues conference at Charles Sturt University in Wagga Wagga, Wiradjuri Country, New South Wales. Unfortunately, I was unable to attend the conference and deliver a paper as originally intended. As I was born in Wagga, and grew up not far from there, I had been looking forward to returning and speaking about my research. I hope that another opportunity such as this will arise in the future. In 1770, Lieutenant James Cook of the Royal Navy sailed HMB Endeavour northwards along the East Coast of the continent now known as Australia. Cook and his crew were on their way home to England, after what would be his first voyage to the Pacific. He had travelled through areas theretofore almost wholly unknown to his people. While charting the coastline of Eastern Australia he supplanted existing place names with names more palatable to English sensibilities. This voyage led to an influx of migration to the region that resulted in the systematic dispossession, exploitation and colonisation of the existing landowners and their nations. I began work on this photographic and research project in 2012 after hiking to Kealakekua Bay in Hawai‘i, where Captain Cook was killed in 1779. I photographed monuments and locations relating to Cook’s voyages while on the islands of Hawai‘i and Kaua‘i. In 2013 in Aotearoa New Zealand, I photographed monuments to Cook on the South Island. In 2014 I travelled on land along the East Coast of Australia, retracing Cook’s 1770 voyage along this coast and documenting the places photographically. I made use of Cook’s journals and charts to approximate locations and again documented monuments. In 2015 I attended the re-enactment festivals that coincide with the anniversaries of Cook’s landings in Gooragan Country (Town of Seventeen Seventy) and Gan Gaar (Cooktown). I am currently continuing this research as a Master of Fine Arts candidate at the Victorian College of the Arts in Melbourne. This year and next I am undertaking a research degree at the Victorian College of the Arts, a faculty of the University of Melbourne. I was recently successful in completing a progress review of my research which means that my candidature is now confirmed and I can continue making art and conducting self-directed research with the University's support. My supervisor throughout the Master of Fine Arts degree is artist, Mark Shorter. The research project I proposed for my MFA forms part of the my ongoing critique of Captain Cook and his three Pacific voyages, a project I began in Hawai‘i in 2012. The practice-led research conducted during the Masters programme will explore the application of decolonising methodologies to artistic practice and the possibilities that emerge as a result. It is my hope that this conceptual framework will provide a means to reinterpret historical events and signifiers of colonisation. The theoretical and practice-led research will result in a photographic outcome and written thesis with major concerns of the project being First Nation sovereignty, colonisation, decolonisation, whiteness and the myth of Terra Nullius. Printed Matter, Inc. presents the tenth annual NY Art Book Fair from 18 to 20 September 2015 at MoMA PS1, Long Island City, Queens. I'm very excited that my photobook Within You Without You will be there this year thanks to Melbourne's own Bloom Publishing! If you're planning on visiting the fair this weekend you'll find Bloom at booth N47. Go say 'Hi!' to Lloyd Stubber and while you're there check out his latest book Fossil Fuels published by Perimeter Editions and Bloom Publishing. I'll be up in Sydney this weekend for VOLUME 2015 | Another Art Book Fair. Presented by Artspace in partnership with Perimeter Books (Melbourne) and Printed Matter (New York), VOLUME 2015 is the official offsite event for Sydney Contemporary. I have a table and I'll be selling the last remaining copies of Within You Without You. You'll find me on Level 1, Stand L1.9A. I'm also hosting a little Sydney launch for the book at my table on Saturday 1pm - 1.15pm. For more details click here. I am pleased to be included among the finalists of the Maggie Diaz Photography Prize for Women with a portrait I made of my partner, Rhenny. The portrait will be on display this month as part of the Maggie Diaz Projects at Brightspace in St. Kilda. "Maggie Diaz Projects features an exhibition of photographs taken in the City of Port Phillip area from the 1960s to the 1980s, along with an installation of photographs that capture the essence of the Diaz Collection, which date back to Chicago in the 1950s. 90 year old Diaz remains a St. Kilda resident and Brightspace is proud to have initiated this project, which celebrates her as a true artist and trailblazer for Australian women photographers. The MDPPfW has attracted an overwhelming response! Finalists will be exhibited as part of Maggie Diaz Projects." Within You Without You was selected as a finalist in the Book category of this year's Mohawk Show. The Mohawk Show is presented in Melbourne and Sydney by BJ Ball Papers. I went along to the Melbourne show last night and was so pleased to see my self-published photobook alongside some great design work. I was presented with a Finalist certificate by Mohawk Paper's Joe O'Connor, who had travelled all the way out from the United States for the event. For those who might not know, Mohawk is a paper company based in upstate New York. The cover of Within You Without You was printed on Mohawk's Loop Digital Antique Vellum and for the internal pages we used Mohawk's Superfine Eggshell White. Bloom Publishing, Hillvale and Home-Work Studio have joined forces to bring us the second annual FOCUS: CameraSwap Meet & Zine Fair. There will be loads of camera gear and printed matter from Analog Cameras, Diane Inc., Film Never Die, Heavytime Books, Knowledge Editions, No Good, Particle Books, Perimeter Books and Vintech. A small number of copies of Within You Without You will be available for purchase from the lovely Bloom Publishing. Lloyd and Brad of Bloom Publishing had a stand at the National Gallery of Victoria's Melbourne Art Book Fair back in May. They were selling their wares and also had some space for publications by "Friends of Bloom". I was so excited by Lloyd's generous offer to include Within You Without You in the curated selection displayed on the cardboard shelving of their stand. It was a great weekend of books and talks and demonstrations. I bought a Bloom Publishing 'Ctrl + P' short sleeved t-shirt (c'mon summer!) and I also sold some copies of my book. Bonus! Everyone was happy. 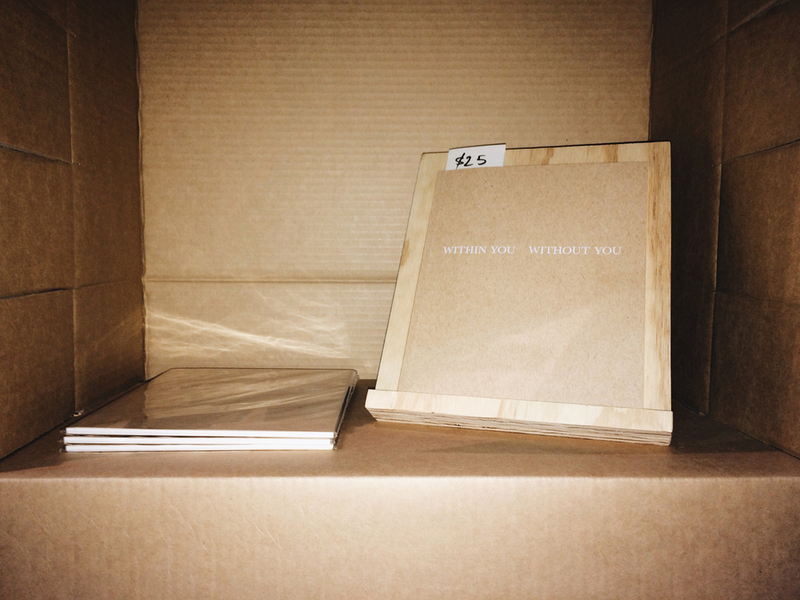 The Indie Photobook Library took their copy of Within You Without You to the West Elm Reading Room at the Philadelphia Art Book Fair in 2015. "For the fifth year in a row, the Indie Photobook Library will be at the Philadelphia Photo Arts Center Book Fair presenting a selection of new photobooks to the archive with a nod to photobook makers in the Asia-Pacific and Mexico!" Thank you to iPL's Larissa Leclair. Within You Without You can now be viewed at The Library Project, a collection of photographic publications located in Dublin, Ireland. Within You Without You is in the Indie Photobook Library. Run by Larissa Leclair, iPL is an archive for self-published and independently published photobooks based in the USA. 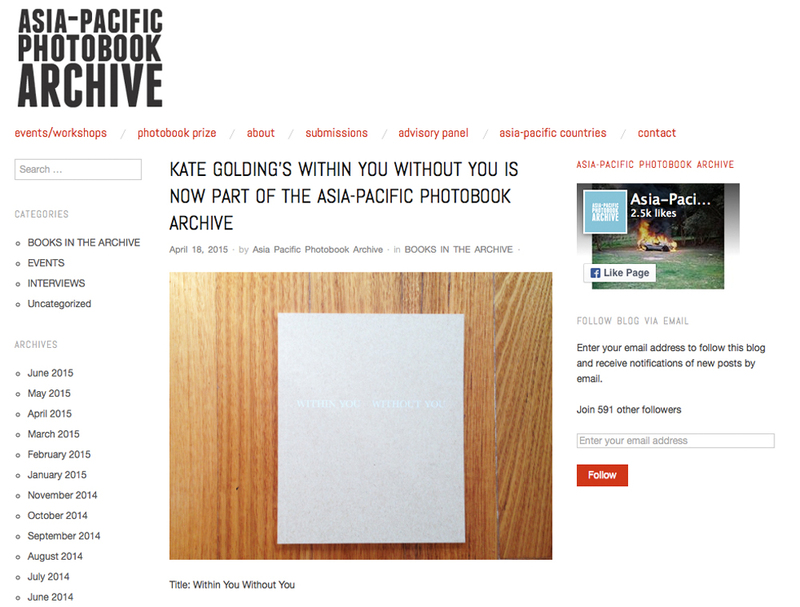 Within You Without You is in the Melbourne-based Asia-Pacific Photobook Archive. APPA was founded by Daniel Boetker-Smith and is a not-for-profit, open-access physical archive of self-published and independent photobooks from the Asia-Pacific region. The twenty photographs in my self-published photobook Within You Without You were created in 2013 while I was travelling around India with my partner, Rhenny. We had each booked a one-way ticket to India after knowing each other for only 8 months, and spent 2 and a half months together moving through different geographic, mental and physical states. We began our travels in Rajasthan, then headed north to an ashram outside of Haridwar. There we chanted, meditated, practised asanas and karma yoga, bathing in the Ganges most days. After leaving the ashram we spent time practising yoga in Rishikesh (and exploring the abandoned ashram of Maharishi Mahesh Yogi - made famous by The Beatles in the late 1960s) before travelling to Delhi for me to attend a Magnum Photos workshop with Raghu Rai. Then we continued the journey south, stopping at a beach in Goa. We were intending to go on to Kerala, to visit Amma and a Sivananda ashram, when we received a call from home informing us that my 99 year old paternal grandmother had passed away. We chose to book a flight home almost immediately. India was a place I had been trying to reach for over a decade, a desire ignited by my love of The Beatles and then fuelled by the weeks I spent at a Sivananda retreat in Austria in 2006 and again in 2011. Like many others before me, I had gone to India seeking meaning, and to deepen my practice of yoga and meditation. Once there this search felt virtually impossible, I was overwhelmed by the frenetic energy of the place and the inevitable negotiations that occur in a new relationship. In the ashram on the bank of the Ganges, we were taught that the outer world reflects the inner world and that the practice of yoga never ceases. When I returned home and developed my rolls of film, I discovered images of calm, solitude, destruction and beauty. In creating this series and book I envisaged a meditation, a journey. Each image subtly linking to the next, speaking to each other in the way I experience thoughts and sensations emerging during my daily meditation practice. Once I had the physical books in my hands I was left with the question - how do I launch a book like this? With a boozy party? No, that just didn't feel right. I chose to host the launch event at the beautiful Ashtanga Yoga Centre of Melbourne and invited my dear friend, Rebecca Knaggs to lead a guided meditation. Afterwards we enjoyed cups of sweet chai and sweltered in the Melbourne heat. It was perfectly imperfect. Thank you to all who came along to the launch in February, to Photobook Melbourne for allowing the event to be part of their program and to all those who have purchased a copy of the book. I am so grateful for your support in whatever form it may take. I'm really looking forward to the Photobook Melbourne Fair this weekend! The event will take place on Saturday 14th & Sunday 15th February from 11am to 5pm at the Centre for Contemporary Photography. I will be there on both days with numbered, signed copies of my brand new photobook, Within You Without You available for sale. Come along and have a chat with a multitude of artists, publishers and book sellers who are passionate about photobooks. There will be so many books to pore over, plus doughnuts and coffee available! I imagine most stalls will be cash-only so if you're looking to buy things bring your real cash money. For the next seven days I'll be posting for PhotoBook Melbourne on Instagram. If you're an Instagram user come follow along @photobookmelbourne. The CCP Salon opened last night in Fitzroy, Melbourne. This year, the Salon features 590 works - both photographic stills and video. The team at CCP did a wonderful job installing all the works. I entered two photographs in the 2014 Salon. The images I chose to enter were my shortlisted works from the Perth Centre for Photography CLIP & IRIS Awards for 2014. I'm also quite honoured that the CCP has chosen to display one of these photographs on their website.